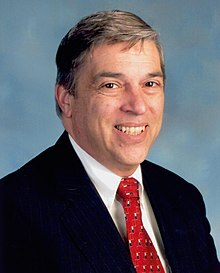 Robert Philip Hanssen (born April 18, 1944) is a former Federal Bureau of Investigation (FBI) agent. He spied for Soviet and Russian intelligence services against the United States from 1979 to 2001. His espionage was called by the Department of Justice as "possibly the worst intelligence disaster in U.S. history." He is serving a 15 consecutive life sentences at ADX Florence, a federal supermax prison near Florence, Colorado. ↑ A Review of FBI Security Programs (Webster Report) (March 2002). Commission for Review of FBI Security Programs, United States Department of Justice. This page was last changed on 5 September 2018, at 23:30.